London, May 3 -- Mrs. Nannie Langhorne Shaw , of Virginia, and Waldorf Astor , eldest son of William Waldorf Astor , were quietly married at All Souls' Church, Langham place, London, this afternoon by Rev. Francis Scott Webster, M.A., the vicar. Neither William Waldorf Astor nor Mr. Langhorne , respectively the fathers of the groom and bride, were present, both being too ill to attend the ceremony. Only immediate relatives and intimate friends of the couple knew of the arrangements, so the congregation was small. It included Ambassador Reid and Mrs. Reid , the staff of the American embassy, Mrs. Reginald Brooks , Mrs. Charles Dana Gibson , and Mrs. T. Moncure Perkins , sisters of the bride, and the Duchess of Roxburghe . Charles Dana Gibson led the bride to the altar, and the groom was supported by his brother, John Jacob Astor . After the ceremony, which was the simple one of the Church of England, Mr. and Mrs. Astor drove to the office of William Waldorf Astor, on the Victoria embankment, where Mr. Astor is lying ill, to receive his congratulations. Later, a reception was held at the residence of Captain Drummond , on Eaton place. Mr. and Mrs. Waldorf Astor will spend the honeymoon at Ford Manor, Surrey, lent to them by Mr. and Mrs. Spender Clay . Later on they will go to the continent. The newly married couple received many handsome presents, including the beautiful Cliveden estate , which Mr. Astor presented to his son, with all its contents, as a wedding gift. 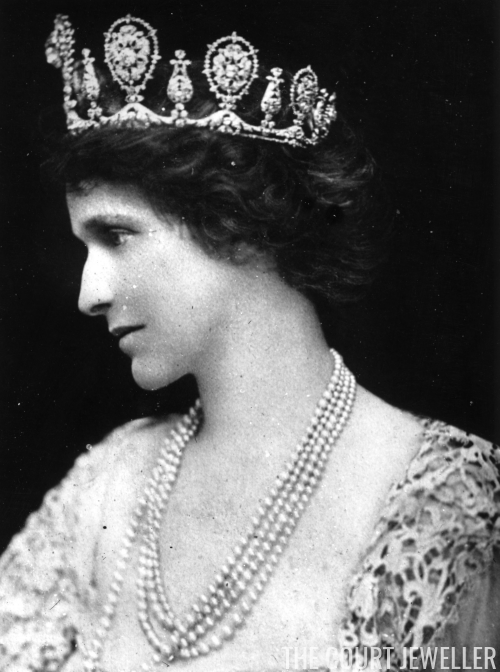 Mr. Astor also gave the bride a tiara, in which is set the famous Sancy diamond , weighing fifty-three and a half carats and valued at $75,000. The groom's present to the bride was a necklace formed by three rows of superb pearls. The wedding originally was arranged for late in May, but as neither the father of the bride nor William Waldorf Astor was likely to be able to go about for some weeks, both, oddly enough, suffering from severe attacks of gout, they urged the young couple to fix an earlier date, and today was finally selected. Only a few days ago the London papers formally announced that the wedding would take place May 19, and other dates had also been chosen, and then suddenly abandoned. The object of today's quiet marriage was to prevent its possible interruption by certain of the clergy of London who object to the marriage of divorced persons in church, whether they are the aggrieved party or otherwise. One of these clergy had threatened to interrupt the Astor-Shaw ceremony with an objection. 1. Nancy Witcher Langhorne (1879-1964) was born and raised in Virginia. Her unhappy and abusive first marriage, to Robert Gould Shaw II, ended in divorce in 1903; shortly afterward, she met Waldorf Astor, whom she married in March 1906. Both Waldorf and Nancy were involved in politics; after he succeeded to his father's peerage, Nancy won his seat in parliament, becoming the first woman to take her seat in the House of Commons. History has not been kind to many of her political positions; she was both anti-Catholic and anti-Semitic, and she supported the appeasement policies of Neville Chamberlain ahead of World War II. Her popularity and public image suffered significantly, and her increasingly polarizing views estranged her from many in her family and social circle. 2. Waldorf Astor, 2nd Viscount Astor (1879-1952) was born in New York but emigrated to Britain with his family in the 1890s. He met the newly divorced Nancy Shaw on a passenger ship from America to the United Kingdom in 1905, and they married less than a year later. The couple had five children together. Astor was a politician, sitting in the House of Commons until he succeeded to his father's title in 1919. He was also involved in newspaper publishing and racing. 3. William Waldorf Astor, 1st Viscount Astor (1848-1919), father of the groom, was the only child of the famous financier John Jacob Astor III. William studied law and later entered politics. With his wife, Mary Dahlgren Paul, and their five children, he emigrated to Britain in the 1890s and later became a British subject. One of his acquisitions in Britain was Hever Castle, the childhood home of Anne Boleyn. In recognition of his large charitable contributions, he was created Baron and then Viscount Astor. 4. Colonel Chiswell Dabney Langhorne (1843-1919), father of the bride, was a wealthy Southern plantation owner and slaveholder. He fought for the Confederate Army in the American Civil War. The family was impoverished after the end of the war, but Langhorne managed to recoup some of his fortune in the tobacco business. He and his wife, Nancy Witcher Keene, had eleven children; Nancy Astor was the eighth. 5. Whitelaw Reid (1837-1912) was the American ambassador to the Court of St. James from 1905 until his death in 1912. Before his diplomatic career, he was a newspaper editor and a vice presidential candidate. Both he and his wife, Elisabeth Mills Reid, were prominent in American social circles in London during the Edwardian period. 6. Phyllis Langhorne (1880-1937), sister of the bride, was married to Reginald Brooks at the time of this wedding. After their divorce, she married Robert Brand, 1st Baron Brand. 7. Irene Langhorne (1873-1956), sister of the bride, was the wife of Charles Dana Gibson, the famous illustrator and creator of the "Gibson Girl." The Langhorne sisters were reportedly among the models for the Gibson Girl illustrations. 8. Elizabeth Dabney Langhorne (1867-1914), sister of the bride, was married to Virginia cotton broker Thomas Moncure Perkins. Their daughter, Nancy, was the owner of the influential design firm Sibyl Colefax & John Fowler. 9. May Goelet (1878-1937), an American heiress, joined the ranks of Britain's aristocracy when she married the 8th Duke of Roxburghe in 1903. 10. John Jacob Astor V, 1st Baron Astor of Hever (1886-1971), brother of the groom, was a politician, businessman, military officer, Olympic gold medalist, and newspaper publisher. He inherited Hever Castle from his father in 1919. He was a longtime head and chairman of the Times. In 1959, he was created Baron Astor of Hever. 11. Major-General Laurence Drummond (1861-1946) was still a captain in 1906, but he was elevated to rank of major-general just before the outbreak of World War I. 12. Herbert Henry Spender-Clay (1875-1937) was a British politician; as the husband of Pauline Astor (1880-1972), he was also the brother-in-law of the groom. Henry and Pauline's daughter, Rachel, later married David Bowes-Lyon, brother of the Queen Mother. 13. Cliveden, the Buckinghamshire home of the Astors, is a famous British estate. Once owned by the Dukes of Buckinhgam, the estate was also leased by Frederick, Prince of Wales (the father of King George III). The Astors used the estate to entertain many famous figures of their day, including Mahatma Gandhi, Winston Churchill, George Bernard Shaw, Franklin Delano Roosevelt, Rudyard Kipling, Edith Wharton, and Charlie Chaplin. Ahead of World War II, the estate's name became linked with the so-called "Cliveden Set," a circle of influential conservative politicians and public figures associated with Nancy Astor. In the 1960s, the estate became notorious for its association with the Profumo Affair. Today, Cliveden is a five-star hotel. 14. The Sancy Diamond is a pale yellow diamond that weighs more than 55 carats. Probably originally found in India, the diamond has been, at various points, a part of the crown jewels of Portugal, England, and France. It takes its name from one of its many owners: Nicolas de Harlay, Seigneur de Sancy. 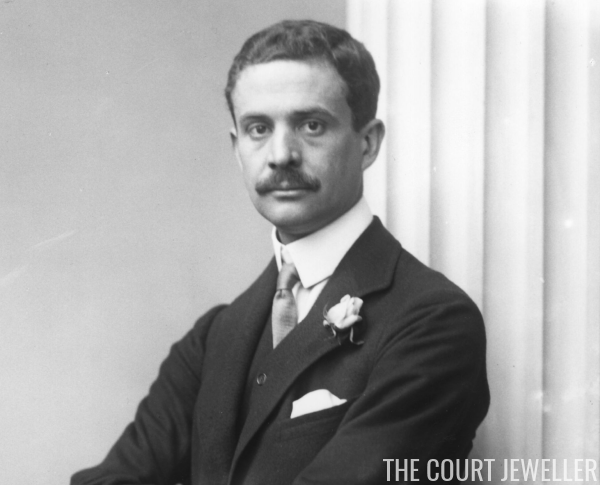 The groom's father, William Waldorf Astor, purchased the diamond in 1906 and had it set in a tiara, which was worn by Nancy Astor throughout her life. 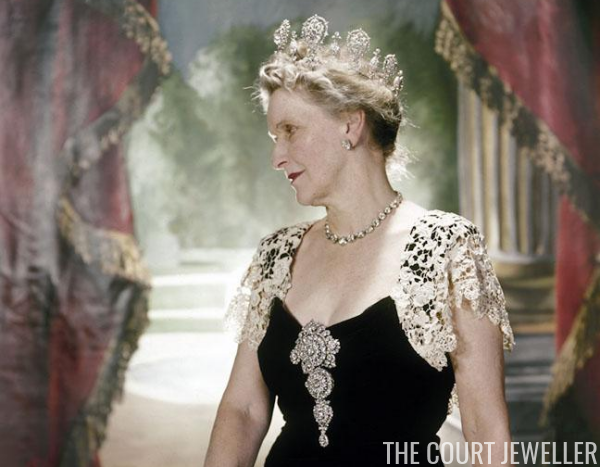 Nancy's grandson, the 4th Viscount Astor, sold the diamond to the Louvre in 1978, and it is still on display in the museum today.